If you like to plan well for a good retirement, to achieve your dreams early and make your this life fruitful, you’ll need to take this financial planning tip seriously and do your planning today and not tomorrow. Everybody, in any of the life stages, will definitely need some form of protection plan (to replace loss of income) against any Critical Illness, e.g Cancer and a good hospitalization plan (on standby) to help cover most of the hospital charges, should you seek any form of treatment in a hospital. It has been statistically proven that most people will become bankrupt because of sickness and those heavy hospital bills associated with that sickness. Therefore the two main factors for planning early for these two areas are: Saving Money In The Long Term and Acceptance. For protection against any loss of income or to have a lump sum of money on standby against any critical illness, it’ll be good to plan early as you are able to save lots of money in the long term. Consider that an average person earns a monthly income of around $2,000 in life and should there be any unforeseen circumstance of striking a critical illness, you may need 5 years (of not being to work) to recover from this, you may need around $120,000 of coverage. At The Age of 1, you could be expecting a monthly premium of around $100 for that coverage of $120,000, whereas if you should decide to get this plan at age of 30, you could be expecting the monthly premium to be above $300 for the similar coverage. 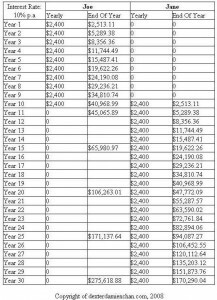 The difference of the around $200 per month, which amounts to $200 x 12 x 20 = $48,000, could actually be a good help to you, getting a good retirement and achieving your dreams early. *Note: Please check with your financial planner with the actual premium rates needed for the $120,000 coverage. The rates may not be the same for every insurance company. With this in mind, you can actually see that you will get to save a lot of money, should you decide to plan early for this. Insurance company is only willing to take you into any protection plan, as long as you are a healthy person. Many people decide to postpone their planning because they feel that they’ll be healthy throughout their life and protection planning is simply just a waste of their time and money. They’ll only start to consider when they feel that their health is no longer in good condition or that someone close to them has a sudden change of health and they saw the impact that this person has to their current lifestyle and to the dependents. You will be loaded at least 125% more in your monthly premium for your protection plan. You will not be allowed to take up any hospitalization plan till your BMI is lower than 30. Therefore planning early while you are still in a pink of health, will ensure that you’ll be accepted by the insurance company. Should your health fails you in the future, at least you know you had your planning done and that the risk is transferred to the insurance company. If you are interested to have a good retirement or even to make your money work harder for you, the tip here, as you know it, is: Start Today! 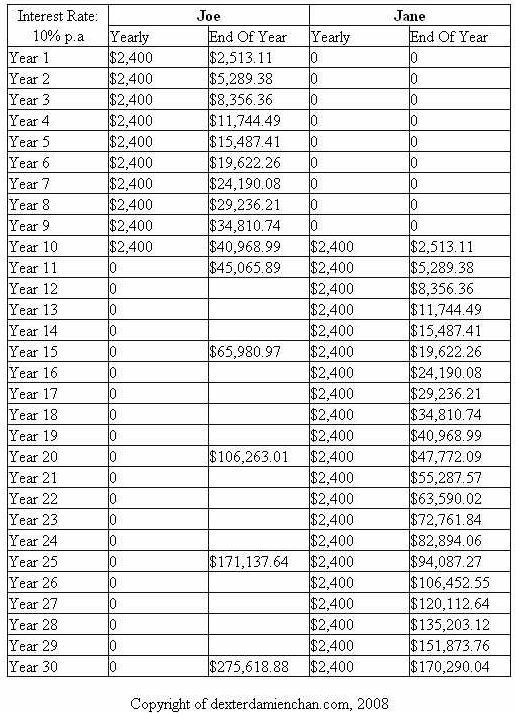 Assuming Joe and Jane are planning to save $2,400 per year into a plan that generates a definite 10% per annual return for the next 30 years. Joe decides to start first while Jane plans to do so after 10 years later. Joe and Jane have different characters as well – Joe decides to save only for the next 10 years, will stop and just let the money roll over; Jane is more disciplined, will continue to save continuously but just need to wait 10 years later. So, do you want to see who is the actual winner in having a higher savings return? If the picture is too small to be seen here, please click on the image to have a better view. If you have guessed Jane is the actual winner, sorry on that. As you can see Joe is the actual winner. Despite the fact that he only saved for 10 years and decided to let time rolled his money over, his savings turned out to be more than Jane’s. What you can learn from this particular point is that, it’s always good to start saving early. Even if you are lazy after a certain number of years but if you have gotten a good investment tool that gives you a good return – the compounding effect on your lump sum savings will generate wonders. In conclusion, if you want to plan well for a good retirement and achieve your dreams faster, it’s always wise to start today and not tomorrow. Saving early will make you a winner as compared to someone who save later.